What did you think of Writing Decimals in Words and their Expanded Notation ? 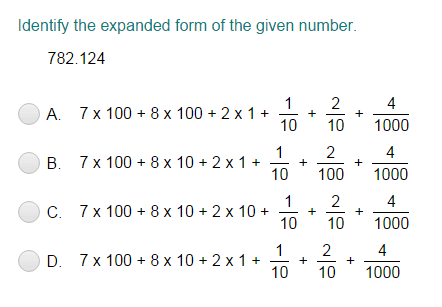 Expanded form is a way of writing a number that shows the sum of values of each digit of a number. Consider the decimal number 68.549. Now let's write 68.549 in words. To write a decimal in words, first, read the digits to the left of the decimal point as a whole number. Then write decimal point as 'and'. Now write the digits to the right of the decimal point as a whole number and add the place value of the last digit at the end. So, 68.549 is written as Sixty eight and five hundred forty nine thousandths in words.